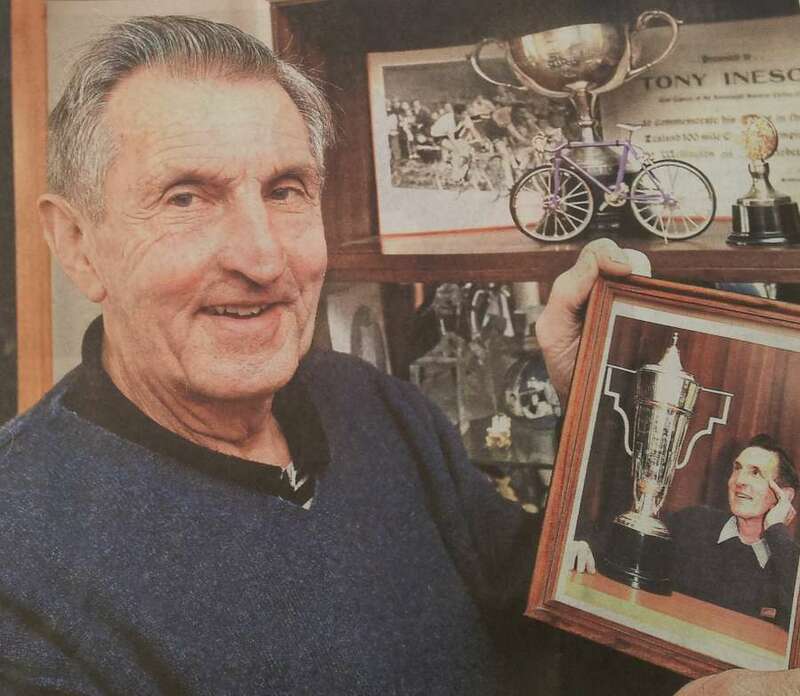 Cycling Southland patron Tony Ineson values many items of memorabilia that mark his many achievements in the sport, but one in particular stands out. His most prized possession is a framed diploma from the International Olympic Committee with the accompanying citation: "For Remarkable Contribution as a Volunteer to the Development of Sport and Olympism and to the Promotion of Friendship and Solidarity among Peoples." His diploma is signed by Juan Antonio Samaranch, president of the IOC, in 2001, the International Year of Volunteers. "At the end of the day it is the camaraderie of cycling people that keeps drawing a man back. I have to keep my hand in and being patron and doing a bit of coaching makes me still feel part of a sport I have loved," he said. "I have to acknowledge the wonderful support of my wife of 42 years, Mary, and our family for putting up with some of my tantrums." Mary recalled that on their 1971 honeymoon, she drove the car and "motor paced" her husband most of the way to Marton in the Central Districts while Tony rode a bike in training behind her, preparing to defend his national 1970 10-mile track title there. Ineson, 72, was honoured with life membership of Cycling Southland in 2001 and was also a recipient of Sport Southland's Service to Sport Award in 2008. A former president of the Southland Cycling Association in the mid 1970s, he served two terms as a selector, covering eight years, and a seven-year period as Tour of Southland commissaire (expert judge), never losing a decision appeal. His role in officialdom also included being Southland delegate to Cycling NZ "on and off" for many years, all duties being unpaid. Ineson, who first worked for three years as a stereo typist at The Southland Times, won several national titles, including the 10-mile scratch race in Palmerston North, the three-mile grass track event at Rugby Park (Invercargill) and the 4000m individual pursuit at Kew Bowl. In all but one of the eight New Zealand 100-mile championship road races he contested, he finished in the top 10, including a first, a second and a third. He also valued four national triumphs as a member of Southland 4000m pursuit teams, prominent team-mates including Les Booth, Rex Marshall, Bruce Goldsworthy and Graham Sycamore. Regular placings in Olympic trials underlined his ability. In 1966, he was a member of the New Zealand team that went to Holland and Belgium as a buildup to the world championships in Germany. Laurie Tall managed the team of six road riders and two track exponents, one being fellow Invercargill-ite Peter Robinson. Ineson's last competitive season was in 1971 when he set out to defend his 10-mile track title, but he punctured in a heat and failed to qualify for the final. "I was coaching Wayne Adams at the time and I put him on his bike set with what I thought would be a winning gear and he won the title. That was a major thrill." About 15 years later, in the mid-1980s, Tony became Southland coach when his son Julian was emerging as a promising rider. Julian gained national honours in the team pursuit at Wanganui and earned a third as a member of the Southland time trial team at Wellington. Tony Ineson became a household name with Southlanders when he featured at many Southland country sports meetings over the festive season. Close associates included Warwick Dalton, Bruce Goldsworthy, Alex Panagiotidis, Ray Alcock, Bill Coates, Peter Robinson and Ray and Rex Marshall. Many Southlanders identified with the track stars from watching them at sports meetings, he said. "I will never forget an experience while training for the build-up to the World Championships. We were involved in fundraising at the time and a farmer pulled alongside in his vehicle and handed us a bunch of notes." Ineson said the roles cyclists played at sports meetings gradually dropped away when young riders preferred the bright lights of Queenstown and Central Otago resorts during the holidays. "We are extremely fortunate to have been wonderfully supported by the public of Southland, the ILT and many hotels - the generosity of those wellwishers is not fully appreciated by many." Nowadays, Ineson enjoys helping Julian on the odd Tuesday night at the velodrome when he is unavailable to coach his team in the 29-strong team Corporate Pursuit, which has run for six years. He said the Tour of Southland had focused worldwide attention on Southland, and had "got bigger and bigger with many generous sponsors". There was always plenty of fun involved when he and Graham Sycamore canvassed Riverton business support in Palmerston St.
"I will never forget an incident connected with a prize for the last into Tuatapere leg of the tour when a chap knew there were still two riders behind him. He hid behind a hedge until they had passed on and then rode into town to claim the prize for last." Ineson's main concern for New Zealand's cycling's future is worrying increases in costs associated with safety issues. "Believe it or not, six Auckland clubs had to combine to cover costs of promoting club events involving more than 80 riders," he said. "The cost of safety measures has climbed out of all reason and is killing the sport, but moves are afoot by the national association to ease the problem."